Philadelphia 76ers center Joel Embiid reacts from the players' bench during a timeout in the third quarter against the Minnesota Timberwolves at Wells Fargo Center. 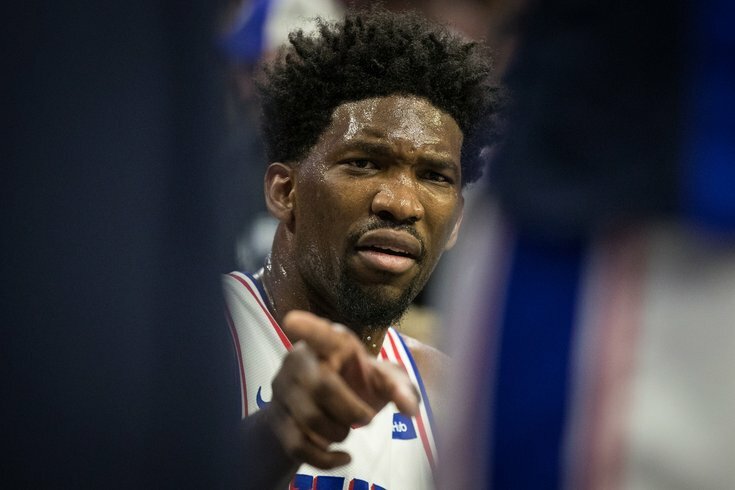 Joel Embiid is still in the process of receiving full clearance to return to the court, according to a source familiar with the situation who spoke with PhillyVoice. Embiid, who is looking at a return to play following surgery to address a broken orbital bone on the left side of his face, will ultimately need final clearance from the surgical team responsible for performing the operation, per a source. Sixers head coach Brett Brown relayed to the media during practice sessions on Tuesday and Wednesday afternoon that Embiid was being slowly reintegrated into the fold for Philadelphia, involved in shooting and scripting work for the first time on Tuesday afternoon. Prior to practice on Wednesday, Brown dismissed questions about whether he was optimistic about a return for Thusday’s Game 3 in Miami. The Sixers listed Embiid as doubtful for Thursday's Game 3 shortly before the 5 p.m. Wednesday deadline to submit their official injury report. The 24-year-old center has been out of action for Philadelphia since injuring the orbital bone in a collision with Sixers rookie guard Markelle Fultz on Wednesday, March 28. Embiid received surgery to address the fracture on Saturday, March 31.